A recall of calcium gluconate injection from American Regent because some vials may contain silicone particles. Potential adverse events include disruption of blood flow within small blood vessels in the lung, localized inflammation and granuloma formation. A label revision for varenicline (Chantix) to include information about the efficacy and safety of the drug in patients with cardiovascular disease and chronic obstructive pulmonary disorder and offer new information about selecting a quit date. Previously, the drug label only included instructions for patients to first select a quit date, then to start taking the medication seven days before their quit date. The updated label offers the alternative of beginning the drug and then quitting smoking between days 8 and 35 of treatment. A recall of the CardioGen-82 cardiac positron emission tomography scanner due to the potential for inadvertent, increased radiation exposure in patients who undergo scans on the machine. A warning on linezolid and methylene blue about the risk of serious central nervous system reactions in patients on serotonergic psychiatric medications, following reports of serotonin syndrome in patients taking the drugs together. The FDA recommends that methylene blue or linezolid generally not be given to patients taking serotonergic drugs, except in certain listed conditions that may be life-threatening or require urgent treatment with the drugs. A recall of multiple lots of vasopressin injection because some vials may not maintain potency throughout their shelf life. Potential adverse events include reduced effectiveness. A recall of GEM Premier 4000 PAK cartridges because potassium test results are too low when compared to a reference analyzer. Use of the product may lead to inappropriate patient treatment and may cause serious adverse health consequences, including death. A warning on fluconazole (Diflucan) that long-term, high-dose (400-800 mg/d) use during the first trimester of pregnancy may be associated with a rare and distinct set of birth defects in infants. This risk does not appear to be associated with a single, low dose of fluconazole, 150 mg, to treat candidiasis. A recall of Arrow NextStep Antegrade chronic hemodialysis catheters, due to reports of breakage and/or separation of the stylet. A recall of the Silencer S2200 centrifuge due to a reported incident of a bucket and insert not being seated on the rotor, breaking the lid, and being forced out of the centrifuge. Results could include serious personal injury, damage to the surrounding area and release of biohazardous materials. A recall of the GE Healthcare Vital Signs hygroscopic condenser humidifier because it may have an occlusion that can prevent proper flow of medical gases or oxygen, possibly resulting in insufficient oxygen delivered to the patient. Ticagrelor (Brilinta) to reduce cardiovascular death and heart attack in patients with acute coronary syndromes. The blood-thinning drug has been studied in combination with aspirin. A boxed warning on the package notes that aspirin doses above 100 mg/d decrease the effectiveness of the medication and that ticagrelor can cause significant, sometimes fatal, bleeding. The most common adverse reactions in clinical trials were bleeding and dyspnea. Anascorp, the first specific treatment for a scorpion sting by Centruroides scorpions in the United States. It is made from the plasma of horses immunized with scorpion venom and may cause early or delayed allergic reactions in people sensitive to horse proteins. The orphan drug was approved based on a controlled trial of 15 children with neurological signs of scorpion stings. Complera, a fixed-dose combination drug product containing emtricitabine/rilpivirine/tenofovir DF, for the treatment of HIV in antiretroviral treatment-naive adult patients. 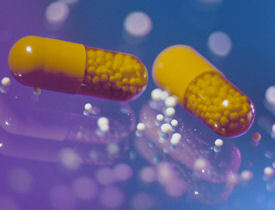 The recommended dose is one tablet, containing 200 mg/25 mg/300 mg, respectively, once daily, taken orally with a meal. The FDA is currently evaluating whether use of oral bisphosphonate drugs is associated with an increased risk of esophageal cancer, after conflicting findings from studies evaluating the risk. At this time, the agency believes that the benefits of oral bisphosphonate drugs in reducing the risk of serious fractures in people with osteoporosis continue to outweigh their potential risks, and that there are insufficient data to recommend endoscopic screening of asymptomatic patients. However, esophagitis and other esophageal events have been reported, particularly in patients who do not follow the specific directions for use of oral bisphosphonates, so physicians should instruct patients to carefully follow the directions for use. The FDA will continue to evaluate all available data supporting the safety and effectiveness of bisphosphonate drugs and will update the public when more information becomes available. The FDA is reviewing data from a clinical trial of the antiarrhythmic drug dronedarone (Multaq) in patients with permanent atrial fibrillation (AF). The study was stopped early after the data monitoring committee found a twofold increase in death, as well as twofold increases in stroke and hospitalization for heart failure compared to placebo. Currently the drug is approved for use in patients with paroxysmal or persistent AF or atrial flutter (AFL), with a recent episode of AF/AFL and associated cardiovascular risk factors, who are in sinus rhythm or who will be cardioverted. A critical question is whether and how the unfavorable results of the study apply to patients taking the drug for the approved indications. For now, the results of the study should be considered preliminary, the FDA said. However, health care professionals should not prescribe dronedarone to patients with permanent atrial fibrillation. The evidence regarding recombinant human growth hormone (somatropin) and increased risk of death is inconclusive, according to an update from the FDA. The agency reviewed results from a study conducted in France, the Santé Adulte GH Enfant study, and other available information on this potential risk, and determined that the study, which found an increased risk of death, had design weaknesses. Health care professionals should continue to prescribe recombinant human growth hormone according to the labeled recommendations, the FDA said.